A loud, high-pitched beeping noise has been resonating from above the door of the 7-Eleven on the corner of Southwest Fourth Avenue and Taylor Street for the past few days. On most days, passersby might notice a small group of people experiencing homelessness sitting on the corner in front of the store, cardboard signs in hand. But today, those who walked by seemed to only notice the noise. The woman working behind the counter inside the store told several people the noise was aimed at vacating the homeless after a previous attempt using classical music failed. 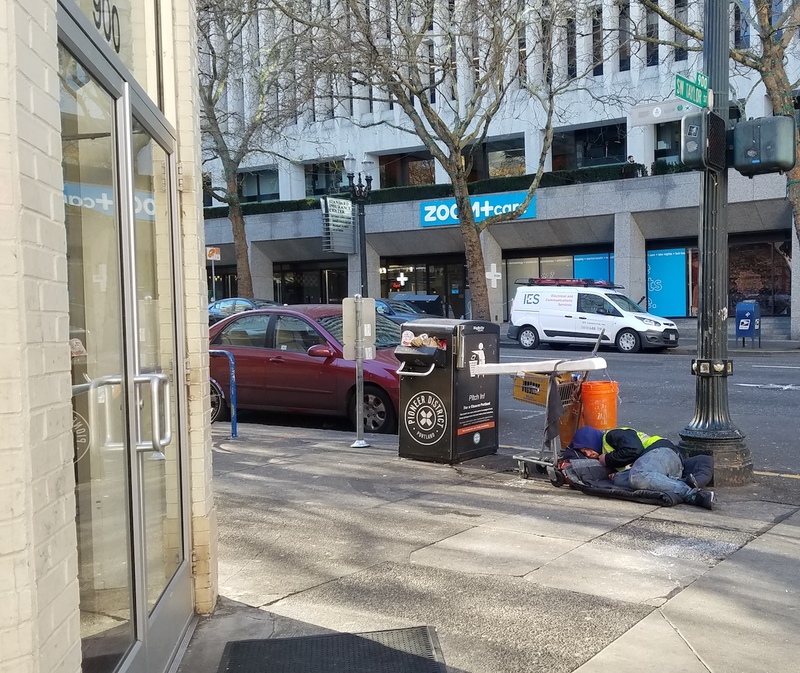 A man sleeps on the sidewalk in front of the 7-Eleven by the Multnomah County Courthouse Wednesday, despite the loud ringing noise radiating from the building. Portland Noise Control Officer Paul van Orden said the city’s received several complaints related to the noise. He measured the octave band sound pressure levels from several sites across the roadways from the store at about 3 p.m. on Wednesday. He determined the sound was out of compliance with the city’s noise ordinance code, saying it was two times louder than permitted. While van Orden is charged with enforcing the noise ordinance, this type of disturbance could also be classified as misdemeanor disorderly conduct, which applies to a person who, among other things, "Makes unreasonable noise." Street Roots, which arrived at the 7-Eleven at the same time as van Orden, followed him into the store, where he told the clerk the noise machine was out of compliance and asked that it be turned off. “We are just employees here,” he was told. He was also told Standard Insurance owns the building, and that he would need to take it up with them. Van Orden said he will follow-up with the property owner. “If they choose to continue using it, they will wind up getting citations,” van Orden told Street Roots. While van Orden didn’t recognize the device that hung from above the door of the 7-Eleven, he has deemed a similar device, The Mosquito, illegal in Portland. The Mosquito emits a high frequency noise that’s only audible to people younger than 30 – it’s aimed at annoying loitering teenagers. If a sound is intended to annoy humans, he said, there is a good chance it will violate the city code. But it’s a coincidence that the code covers these noise machines. “It was never designed to address this issue, it was designed to ensure that someone trying to enjoy their property, sitting in their yard and read a book, wasn’t impacted by sounds,” van Orden explained. He said he hasn’t heard of an issue of this nature in a while, but these types of devices have been around at least 10 years. An earlier version of this story indicated 7-Eleven was the owner of the building as it's listed as such on the city assessor's website, however, that listing is incorrect. The actual owner of the building is Standard Insurance.